Corey Crawford stopped 25 shots posting a shut-out. Blackhawks tamed the Wild 3-0 in Minnesota last night. The Hawks lead the series three games to one, and can close it out tomorrow night at the United Center. After the underdog Wild played a tough physical game three, the Hawks responded and pushed back in game four. It has been a terrific comeback for one Blackhawk-Patrick Sharp. He scored two goals last night and four in this opening series. Not bad for the Hawks left winger who missed a lot of time during the regular season with a bad shoulder. During the shorten season he only tallied six goals. Minnesota was forced to go to their third goalie of this series when Josh Harding was injured stopping a shot by Jonathan Toews with three minutes left in the first period. Harding gave up a re-direct goal by Sharp in the opening period. The Wild started the second period with inexperienced 23 year old Darcy Kuemper, the first shot he saw turned out to be an unassisted goal by Sharp. Another Hawk having a good series is Bryan Bickell; he scored on an awkward wrist shot late in the game. The big winger has three goals against Minnesota this series. The home team had plenty of opportunities with six power plays, including back to back, starting the third period. The Hawks were able to turn them all away. The penalty kill for Coach Joel Quenneville’s team has been one of their biggest improvements from the past couple of seasons. Of course, Minnesota is an offensively-challenged team. 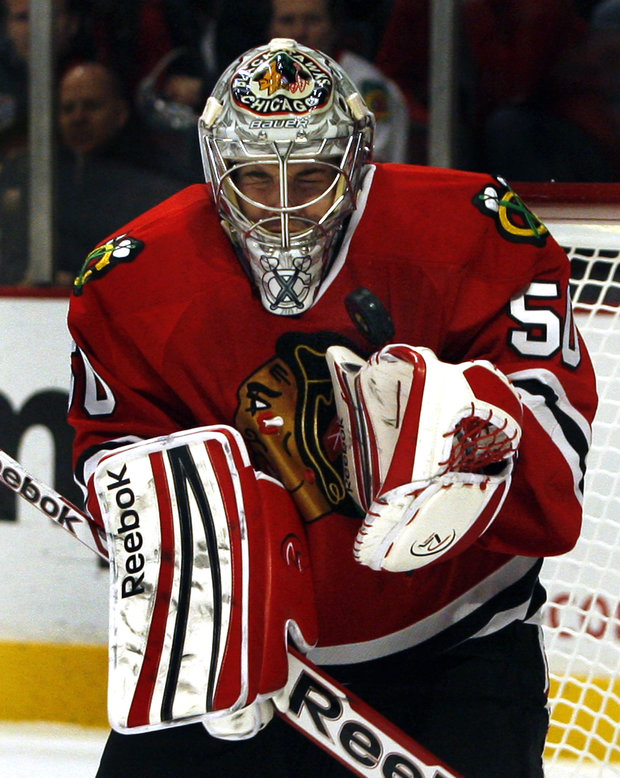 For Blackhawk goalie Corey Crawford it was his second career shut-out with twenty-five saves on the night. There was one tired player on the ice before the game even began- Duncan Keith. The Hawks “iron man” defenseman made a trip to Chicago hours before the game to see his wife Kelly-Rae gave birth to their first child, Colton Duncan Keith. Then the new dad was able to rejoin the team in time for the late game, but did not start. One interesting note, Jonathan Toews still has no points in this series. It won&apos;t matter to the Hawk captain if his team keeps on winning and one more victory on Thursday will end this best of seven game series against Minnesota. The other UC tenant-the Bulls have another big game tonight. They will be facing an unhappy Miami Heat team looking to avenge their loss to the Bulls on Monday. The past few days is seems the Bulls have become the darlings of the NBA. No one thought they could steal game one, but they did against the complacent defending champions. Jimmy Butler and Nate Robinson have become cult heroes in the sports world. Butler for his defense and late game scoring and Robinson for getting eleven stitches after being manhandled by LeBron James. Nate was a scoring machine again. Look for the Heat to come out with more intensity, James will probably attack the basket more. Miami’s perimeter players , Ray Allen and Shane Battier will attempt to score beyond the three-point arc. The Bulls will try to continue their strong defensive stance, they know the heavily-favored Heat will try to break them down and entice more fouls. Miami will also try to force more Bulls turnovers, so they can score easy transition baskets. It is still an underman team for Coach Tom Thibodeau, Luol Deng and Kirk Hinrich will likely be out. It doesn’t matter, this Bulls team believe in their coach, believe in the system, believe in each other and believe they can win. It won’t be a lack of trying.